Abstract: Previous studies of Christian runic inscriptions have tended to deal with par­tic­ular types of inscription from defined periods of time. This article analyses all the relevant Scandinavian runic material from the Viking Age and the Middle Ages, focusing on textual features and material contexts of inscriptions that use prayers and invocations. Its main aim is to explore the dynamics of what may be termed “the runic prayer tradition” with a view to identifying potentially stable elements of this tradition as well as those that alter over time. Two main categories of prayer and invocation explored are formulations in the vernacular and in Church Latin. The results of the study reveal various possibilities of variation in the runic prayer tradition, but also suggest links and overlaps between the earlier and later vernacular prayers. The evidence further suggests some sort of a division between a monumental (or public) form of discourse in connection with rune-stones, grave monuments and church buildings — which are dominated by vernacular prayers — and that of various loose objects, where Latin prayer formulas seem to be favoured. Introduction: Many runic inscriptions from the Viking Age and Middle Ages are directly related to Christian culture — they originate from a period during which Christianity was introduced and gradually institutionalized. The emergence and increase in number of certain types of inscription have been associated with Christian practices. There has, for example, been discussion of the role of Christianization in the rise and spread of the late Viking Age rune­stone custom. 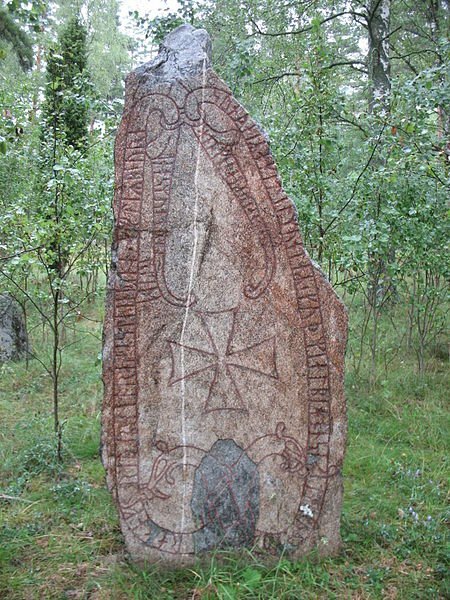 The obvious and immediate outcomes of the interaction between the native epigraphic tradition and Christianity, however, are medieval Christian runic inscriptions on grave monuments, on the walls and furnishings of stave and stone churches as well as on different types of religious object. A common approach to Christian runic inscriptions is to look at particular types of inscription, categories of artifact, regions or periods of time. This article explores some aspects of the dynamics of the overall tradition, based upon preserved Viking Age and medieval inscriptions from Den mark, Norway and Sweden. There are a few concentrations of inscriptions in other parts of the Nordic realm where settlers of Scandinavian origin made use of runic script, but these date either from the Viking Age (the Isle of Man) or predominantly from the Middle Ages (Iceland and Greenland). This material does not allow for the study of the dynamics of Christian runic inscriptions in the way the material from Scandinavia proper does. The focus is on Christian prayers and in­ vocations. Other expressions of Christianity are ignored, e.g., cross ornamentation and pictorial evidence, which especially in the case of stone monuments complement the textual elements. Various Christian features of rune­stones and grave monuments have been examined in previous studies — either in isolation or in combination with each other. The focus here is narrowed to the analysis of textual features and material contexts of inscriptions that use runic prayers, with the aim of distinguishing those features which are relatively stable elements of the corpus from those which alter over time.